Trailhead/access: West Point on the Eno city park, 5101 North Roxboro Road, Durham, and at the Eno River Association headquarters (the red brick house) on north bank of the Eno River at Guess Road. Park at your own risk. Overnight parking is prohibited. Gate hours at West Point on the Eno are 8 a.m. to sunset. Click on map below for more detail. There’s a secret on this hike that you discover about a mile in. 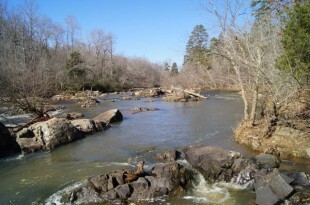 After passing the working mill and ample millpond at the trailhead, after crossing the Eno on the new pedestrian bridge, and after navigating around the mill pond dam, you lose touch with the river for a short period. But then you come over a rocky passage and there it is: Sennet Hole. This rock-rimmed pool (a little smaller than a community pool) is a favorite for folks looking to cool off on a steamy summer’s day. It may be tepid on top, but dive down five, 10 15 feet in the middle and a chill is guaranteed. Ample rocks for sunning afterward. The trail proceeds along the river upstream before taking a turn upland with about a half mile to go. Keep an eye out for the white blaze; well-trod neighborhood trails are notorious in this stretch for luring hikers off the mark. And don’t be concerned if it appears your hike winds up in someone’s backyard. That brick house is actually home to the Eno River Association, which has been preserving land along the Eno since the 1960s. A popular way to hike this trail is as a 4.4-mile out-and-back from West Point on the Eno. A shuttle isn’t really justified on a 2.2-mile hike, and you avoid the issue of parking at the Eno River Association headquarters, which can be tight at times.